Vancouver, BC - Lifespan Society of British Columbia and Keegan Macintosh today commenced a civil suit challenging the constitutional validity of the prohibition against cryonics services enacted by s.14 of the Cremation, Interment and Funeral Services Act (CIFSA). The Province of British Columbia is the only jurisdiction in the world that has enacted a prohibition against cryonics services. Cryonics is the practice of preserving a human body at very low temperatures after clinical death. Cryonicists preserve their bodies from decay in the hope that medical science will advance to a future point when their bodies can be resuscitated and restored to health without compromising their memories, personalities and identities. The use of cryonics is predicated on the possibility that currently untreatable medical conditions, including the process of aging itself, could be treated in the future at the time of removal of the patient from low-temperature storage. Contravention of s.14 of CIFSA by an individual carries a maximum sentence of $10,000, a term of imprisonment of 12 months, or both. The maximum fine for a corporation is $100,000. The plaintiffs, Lifespan Society of British Columbia (which is registered as a non-profit society) and an individual cryonicist, Keegan Macintosh wish and intend to enter into a cryonics arrangement but are prevented from doing so by s.14 of the CIFSA. If the lawsuit succeeds, Lifespan Society would create long-term cryopreservation facility in British Columbia and a transportation service with pre-cooling prior to transport. 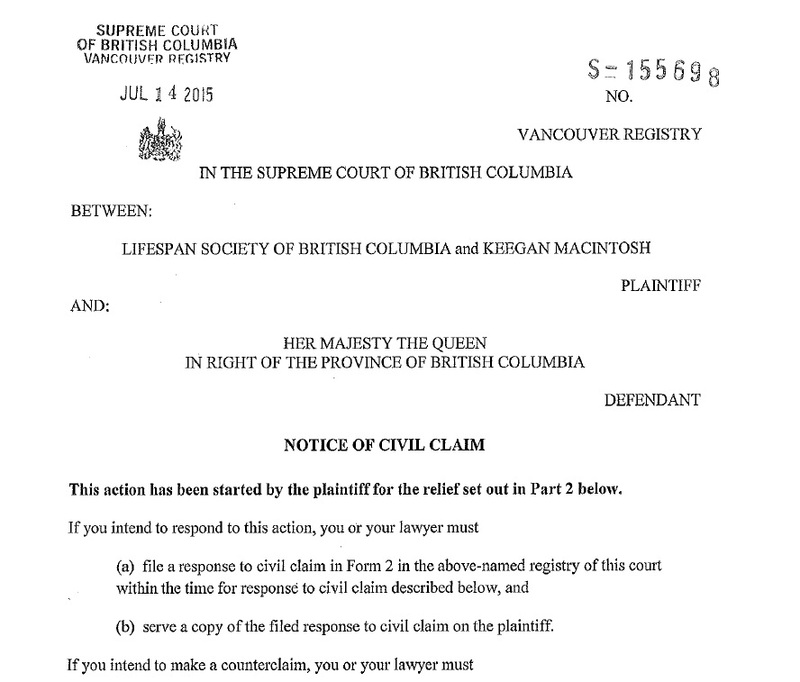 Below is a link to our Notice of Civil Claim Filed on July 14, 2015 against the provincial government of B.C.